Even though our one year journey around the world finished back in September, 2009, I got infected with the travel disease. It was probably somewhere in Australia that I got bit by the travel bug so I'm am continuing to do so. But this time, it's without my good buddy and former travel companion William. So instead of posting on the Two Guys Around the World site, I've been posting travel updates one my personal website over as SamPowers.NET, a site I've had since high school. 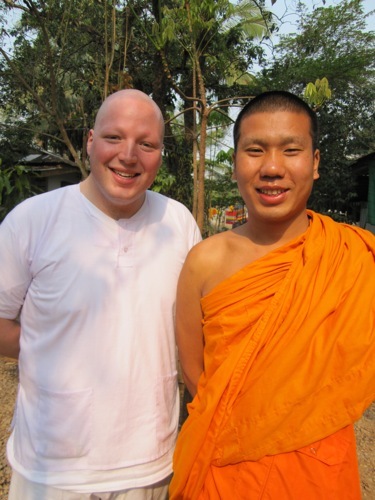 I'm currently in Thailand learning the ways of Buddhist monks. And I have no hair on my head! Soon I will be in Ukraine and will live there for about 2 months. I don't think a week goes by that someone doesn't remind me about the videos that need to be posted on the site still. I know - I really hate leaving things hanging like that and I'm determined to sum up everything, but it will be some time. The plan is to finish them off this summer when I get back to the States. At the very least I'll post a video summing up the whole rest of the journey and a "where are they now" bit. Until then - it's been real and you loyal TGATW fans have been a blessing to us. Thanks for the wild ride so far; let the journey continue! « What happened to TGATW? I'm very happy to finally see another new post here, even if it's not one of your amazing videos. I've been patiently waiting and have kept the feed in my reader as I expected you would not leave such a wonderful website unfinished. I followed your trip with William as far as you let us and really enjoyed watching and reading about your adventures. Glad to see you're having more amazing experiences over the world. Spending a year in Australia myself, I can see how that travel bug got to you. I will definitely try and catch up on your personal website. Good luck and all the best to you. And thanks for sharing. Crazy stuff! Is Buddhism OK with West Coast Swing though? I was wondering if you would recommend RTW travel options like SkyTeam, SkyAlliance, oneWorld and The Great Escapade. The Great Escapade offers 29000 miles for about 1K euros, which seems way too good to be true. I'd like to go from Italy to Dubai to New Zealand for only about a month (2 months max). What do you recommend? I hate to be a total pest, but I believe you have a treasure trove of unreleased video that the world needs!!! @andyBhewitt I agree! I'm actually in Turkey at the moment until the end of the month. :) But I still haven't forgotten to work on the final summary video. Before I left on my own adventure (during which I also lived briefly with monks in Northern Thailand), I watched all of your videos. I know now, after making my own travel podcasts, how much work you all put in. So keep the anticipation building, we're looking forward to it.